Catholic of Pointe Coupee is an institution dedicated to the formation of youth to the stature of Christ. Each child is accepted with his own inherent personality and potential for growth. This school strives to lead each student to develop his spiritual, intellectual, physical, moral and emotional endowments so that he may acquire a mature sense of responsibility in forming his own life properly and in pursuing true freedom. By fostering the spirit of mutual respect among teachers, students and families, the school works for the good of all within the community. Cognizant of the privilege of being entrusted by parents with the education of their children, teachers are aware of the responsibility, which rests upon the school. They seek to profit in guidance, strength and wisdom from Jesus, the model teacher, and from the bond of union created among them by their common interest and personal dedication to the welfare of the students. 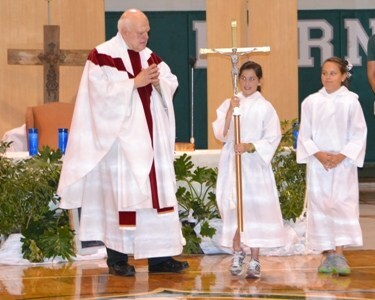 The most important facet of our educational endeavors is our religious education program. Christian attitudes and principals are by far more important at Catholic than any subject matter that may be taught. Each day begins and ends with prayer. Christian formation includes liturgy, daily religious instruction, seasonal penance services, Adopt-a-Class and observation of major church Holy Days such as Christmas, Easter, etc. Students are instructed in the value of family life and the importance of maintaining a sense of well-being. Sacramental preparation classes are held for second graders receiving the sacraments of First Penance and First Eucharist. Each class has a crucifix prominently displayed, one bulletin board devoted to a religious theme and a prayer table. Parish school of religion classes meet in our school on Tuesdays for local public and private school students.